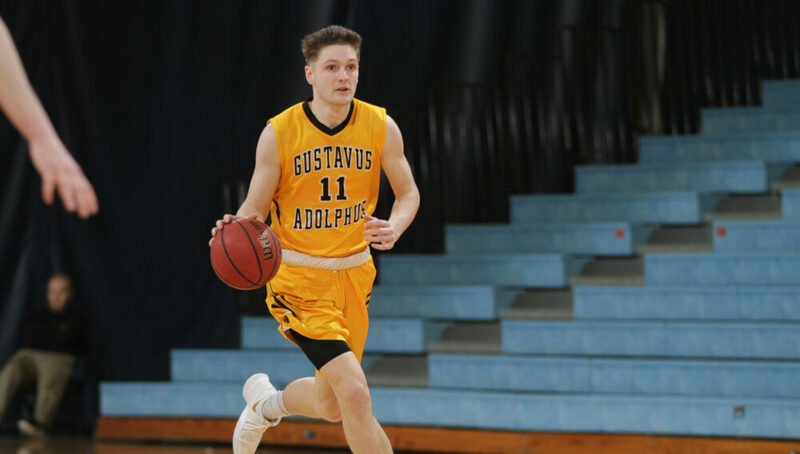 SAINT PETER, Minn. – The Gustavus men’s basketball team saw its five-game home winning streak snapped on Monday night when No. 5 St. Thomas completed a comeback in the second half to take home a 74-66 victory. With the loss the Gusties fall to 10-12 overall and 7-10 in the MIAC while the Tommies improve to 20-1 overall and 16-0 in the league. The game got off to an even start with both teams battling early and neither able to take more than a possession lead until a Vannis Smith (Jr., Crystal Lake, Ill.) layup gave Gustavus a 13-9 lead at the 13:56 mark. St. Thomas answered quickly hitting three-pointers on two of its next three possessions to take a 15-13 lead. The Gusties tied the game on their next possession thanks to a Logan Rezac (So., Andover, Minn.) layup and the game was tied again at 19-19 a few minutes later but the Tommies went on a 7-0 run to take the lead, which they wouldn’t relinquish in the first half. The Gusties were able to trim the deficit before the break and trailed just 34-30 after 20 minutes of play. In the first half the Gusties shot 12-29 (41.4 percent) from the field and 1-10 (10 percent) from three point range while the Tommies shot 12-29 (41.4 percent) from the field and 5-16 (31.3 percent) from beyond the arc. After the Tommies came out and outscored the Gusties 5-4 in the opening 2:07 of play in half number two Gustavus got hot. The Black and Gold went on a huge 22-7 run to take a commanding 57-45 lead. The No. 5 team in the nation didn’t give in easy though as they showed why they’re leading the league in three-pointers made per game when they buried there next three shot attempts, all from behind the arc to trim the lead to three. After the Tommies cut the deficit to one, a CJ Woda (So., Maple Grove, Minn.) hook shot in the paint pushed the lead back to three but it was all St. Thomas from there on out. The Tommies went on a 5-0 run to take a two point lead and a Woda free throw would cut it to one but the Tommies got a layup to push their lead back to three. After a Gustavus miss, and with time winding down on the shot clock St. Thomas took a three from well beyond the arc and connected to extend the lead to six with 1:30 remaining which proved to be the proverbial dagger. The Gusties couldn’t get shots to fall late and the Tommies made their free throws down the stretch to ice the game. In the contest Riley Sharbono (Sr., Marshall, Minn.) led the Gusties with 11 points to go along with six rebounds and three assists. Spencer Tollefson (Sr., New Richland, Minn.) and Isaac Douglas (So., Montevideo, Minn.) were also both in double figures with 10 each. Three point shooting proved to be a huge difference in the contest as the Gusties finished 2-20 (10 percent) from beyond the arc while the Tommies were 11-27 (40.7 percent). Gustavus outrebounded St. Thomas 41-24 in the game including 9-1 on the offensive end. The Gusties will next be in action on Wednesday when they travel to Augsburg for a 7 p.m. contest.